When several people recently cashed lottery tickets that made them multimillionaires, perhaps you wondered the same thing I did: Why were news reports calling their prize money a “windfall”? In other words, why is unexpected financial gain or good fortune called a windfall, and not something like “luck-apalooza”? Not wanting to risk losing sleep, I went to my books and looked it up. There are some authorities who think windfall is an old sailing term, but the most plausible explanation goes back several hundred years and is based on an English law governing rights to timber. Commoners and certain landowners were forbidden to chop down trees because the Royal Navy had first dibs; they didn’t want future ships being burned as firewood. There was a provision in the law, however, that if wind blew down branches or uprooted trees, that wood was up for grabs. So — whatever the wind caused to fall was somebody’s lucky break. Another word that got used a lot during the lottery frenzy was “bedlam”. You’ll recall that liquor stores and markets had long lines of ticket buyers and occasionally unruly behavior broke out. It was much like department stores on the day after Christmas, or Apple stores when a new i-thing is unleashed on the public. These scenes of noise and confusion are often characterized as bedlam by some breathless reporter. Its location in London changed several times over the years, and so did its name. At some point Bethehem got shortened to Bethlem; the pronunciation became “Bedlam”. By all accounts it seems to be a top-notch facility now (as Bethlem Royal Hospital), but that was not always the case. Far from it — Bedlam was notorious for the brutal treatment of its patients, many of whom were chained to the walls. They received no systematic care; they were simply detained there, and as you might imagine, it was not a quiet place. The howls of violent patients set off wails from frightened patients, and so on. 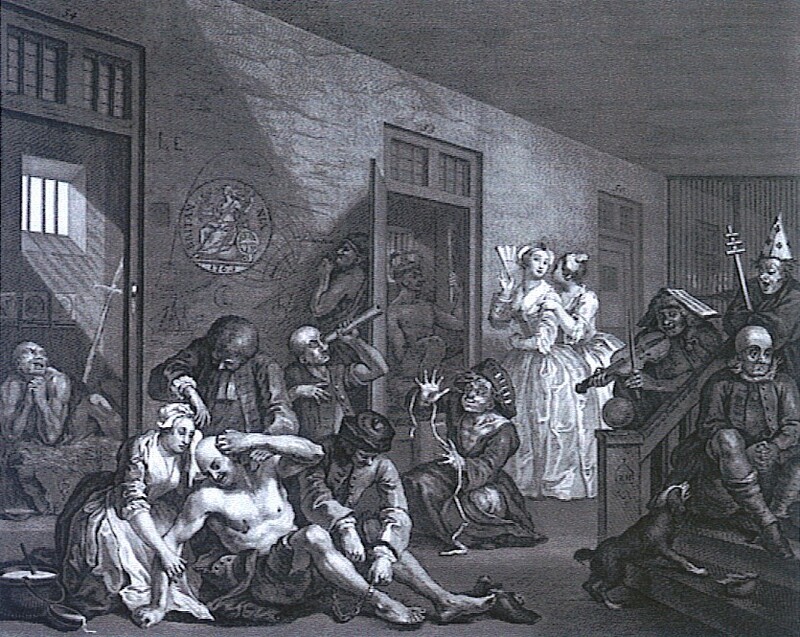 The most shameful aspect of Bedlam was that by the 1700s, it had become, in effect, a tourist attraction. For a penny, visitors were allowed in to stare at the inmates and laugh at their odd behavior. In our enlightened age, we condemn that sort of insensitivity toward unfortunates who have mental health issues. We only watch them on television now, and at least the Real Housewives of Bedlam get a windfall for putting their misery on public display. This entry was posted in Language and Literature and tagged bedlam, windfall. Bookmark the permalink.